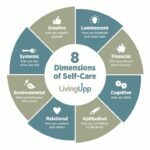 The LIVE 8-Week Self-Care eCourse is designed to help you explore the 8 Dimensions of Self-Care so you can create a self-care practice that helps you live up to your highest potential. Over the course of 8 weeks, you’ll learn how to assess your current self-care habits, identify and prioritize your unique needs, and use your time and energy more efficiently and effectively. Sessions will be delivered LIVE via Zoom (dial-in option also available), and recordings will be accessible within a private Facebook group. By the end of the eCourse, you’ll be able to create a comprehensive self-care practice that helps you live with more ease and balance. Each of the eight 1-hour LIVE sessions will be conducted via Zoom and will address the key components of each of the 8 Dimensions of Self-Care. You’ll have an opportunity to ask questions during the live sessions to get the most out of each training. Can’t make it to a LIVE training? We’ve got you covered. You’ll have access to the recordings in the private Facebook group up until two weeks after the program’s close so you can listen back at your convenience. After registration, you’ll receive a workbook (delivered digitally) to help you stay focused and organized as you move through each lesson. Contents include self-care activity lists, worksheets, and other resources designed to help you map out your self-care plan. You’ll also be invited to be part of a private Facebook group, where you’ll receive support and encouragement from others who who are on a similar self-care journey. In this safe, nonjudgmental space you can celebrate your successes, find motivation to stay focused on your goals, and access resources to help you deepen and refine your self-care practice. This 8-Week Self-Care eCourse provides simple tools for creating a self-care plan that fits your lifestyle and needs. Are you ready to live with more ease and balance?